Went up last week to see the Christopher Wood exhibition at Kettle’s Yard. Small,but with some well-known pictures, including the self-portrait wearing a harlequin jumper. Whilst I waited for the gallery to open (it doesn’t open until 11.30), I recalled seeing previously their collection of letters from Peter Watson to Jim Ede. I also popped into the adjoining church of St Peter’s. Tiny and spartan and maintained by the wonderful Churches Conservation Trust, the main feature is the font. 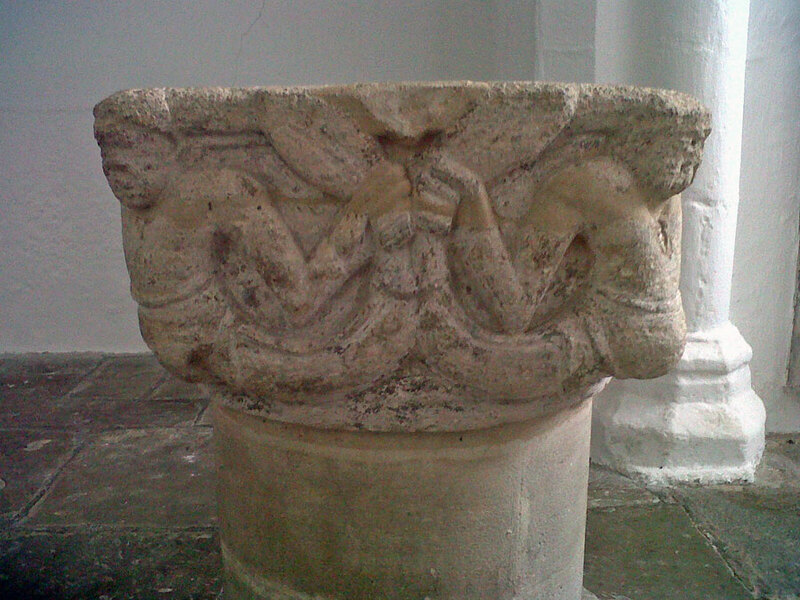 It is enlivened with what are described as “two-tailed mermen”, a feature only appearing on one other font in the country. I also picked up some nice publications (free) on Cambridge sculpture trails. To my shame, one of them (there are 3) pointed out that when I was living in St Peter’s Terrace in Trumpington Street (part of Peterhouse), there was an adjacent sculpture in aluminium by Kenneth Martin, which I had never realised. From 1967, it stands at the entrance to the Engineering Faculty next door to Peterhouse.